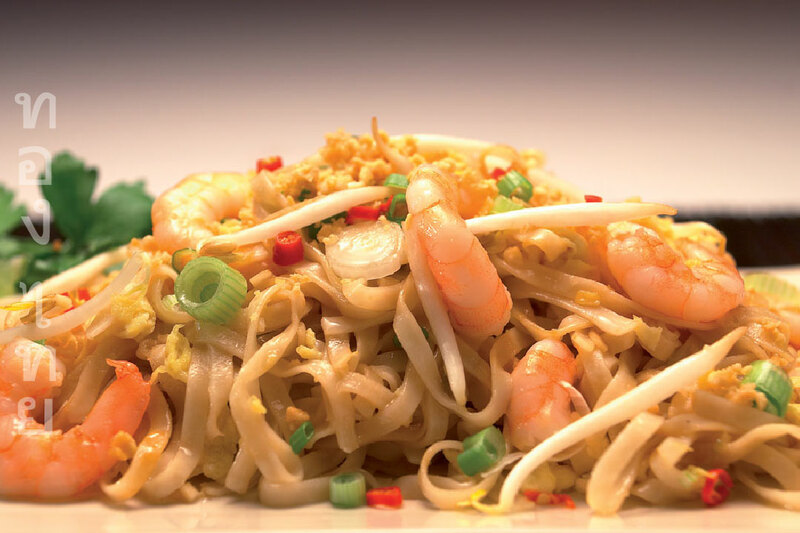 The signature Thai stir-fried noodle dish, if you have been to Thailand on a holiday you will have had a hard time avoiding it. The primary flavour is tamarind, a wonderful fruit that grows in the mountainous areas of Thailand. Cook the noodles and rinse with cold water when cooked. Heat the pan and oil up to stir-fry temperature. Add the noodles and stir-fry for about two minutes. Add the Pad Thai Sauce and cook for about two to three minutes. Add the beaten eggs and stir-fry until the eggs are cooked. Turn off the heat and serve onto dishes. Serve with beansprouts, spring onion and crushed peanuts on top. Tip: The Thais add crushed dried chili after serving if they want to spice up a noodle dish. Learn: This is an easy stir-fry, check out how to stir-fry on this site if you're not feeling confident. Variation: You can try this with any meat, seafood or tofu. Add meat at Step 3 or seafood at Step 6.